While “child-friendly” or “family-friendly” may not automatically come to mind when, say, Bourbon Street is mentioned, New Orleans is packed with things you can do as a family, for kids of all ages. 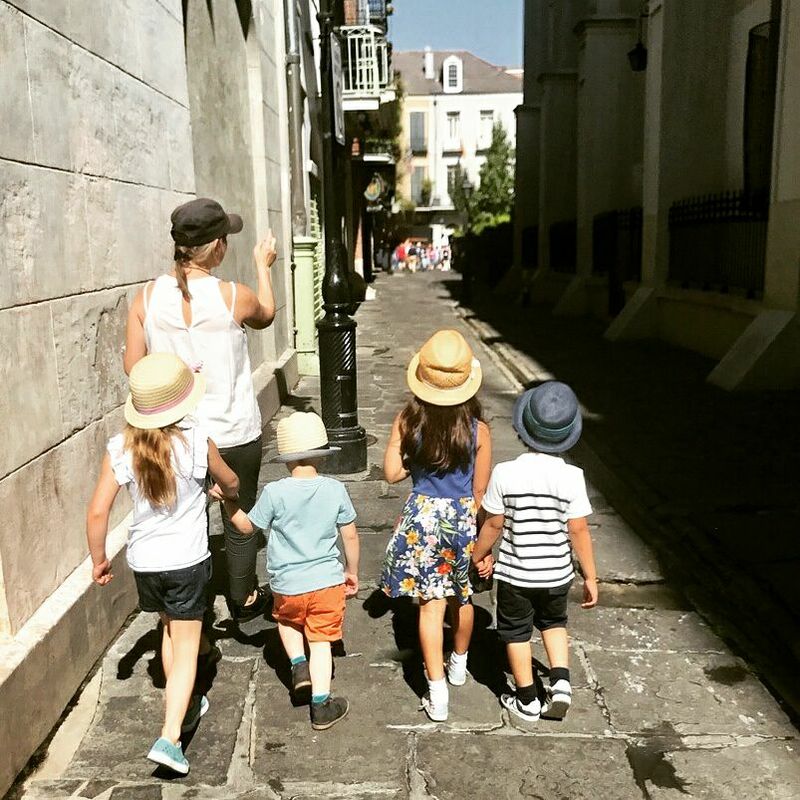 Here are our favorite family-friendly destinations and things to do in the French Quarter. You can cover these in a day, on foot (or in a carriage! ), and with kids in tow. Start off with a relaxing breakfast of crawfish frittata or boudin benedict at Vacherie Restaurant located inside Hotel St. Marie. Chef Jarred Zeringue concocts inventive Cajun and regional Louisiana dishes using local ingredients like Andouille sausage and Creole tomatoes. There are kid-friendly items on the menu too, such as omelets, oatmeal pancakes and house-made granola. For an old-world French breakfast or lunch, head to Croissant D’Or. This intimate, Parisian-style patisserie tucked between Royal and Chartres on Ursulines Street will satisfy the whole family with its array of cakes, quiches, fruit tartes, and sweet and savory croissants. Everything is made daily and served fresh from the bakery. The cafe au lait and cappuccino are perfect, and there’s a magical little tiled courtyard. Of course there is the classic local breakfast/snack option, the 24-hour Cafe du Monde on Decatur Street. Since 1862, this iconic cafe has been serving a simple menu of coffee and beignets. The cafe is open-air, so there’s a lot of room in which to navigate, no reservations necessary. Your visit will probably be accompanied by live music coming from any number of the street entertainers performing nearby. For a sneak-peak at how beignets are made to order, walk all the way back inside the cafe. Another French Quarter gem, the gleaming and spacious Salon by Sucre at 622 Conti Street, serves a dizzying array of confections complemented by a state-of-the-art coffee bar. Try a macaron or artisanal chocolate. Upstairs, Salon Restaurant by Sucre serves full lunch and brunch menus with freshly baked pastries, desserts and sandwiches. After a day of sightseeing, cool off with one of La Divina Gelateria‘s inventive gelatos or sorbets, made daily from scratch. La Divina also offers freshly baked pies, cakes, cookies, and cannoli, as well as a full lunch menu of panini, salads and soup. 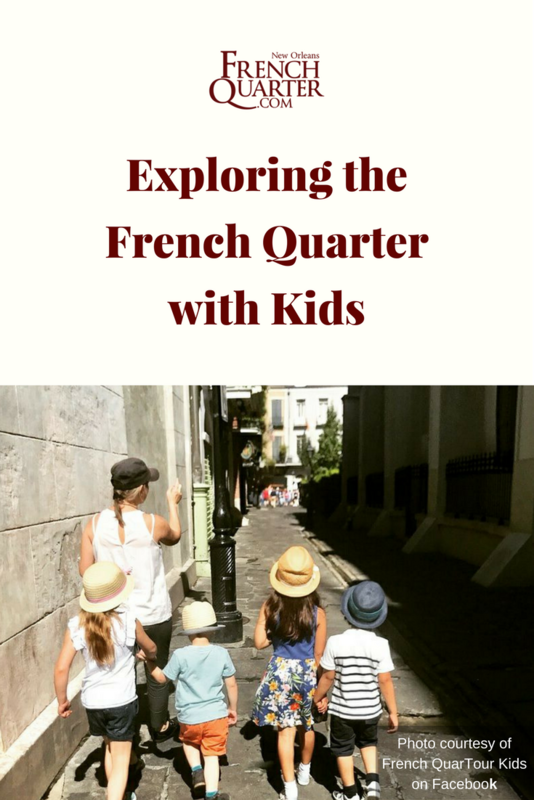 While some tours are decidedly not for little ears because they focus on vampires and ghosts, French Quartour Kids caters to kids ages 4 to 18 with four 1-1.5 hour-long walking tours, all within a six-block radius ($20, chaperones required). There’s the Spooky Tour, a child-friendly version of the ghost tour. The teen tour (13-18) explores the history of French Creoles and the military and trade past of New Orleans. The Creole Kids tour (7-12) focuses on 19th-century life in New Orleans. The tour for the very little ones (4-7) keeps it simple and fun with a treasure hunt and dress-up. Don’t feel like committing to a guided tour? The Cabildo and the Presbytere, two historic buildings flanking St. Louis cathedral on Jackson Square, are part of the Louisiana State Museum. Each offer excellent exhibits (admission to either is $6). The Cabildo houses such precious artifacts as a painting of Marie Laveau by Frank Schneider and a rare death mask of Napoleon. On the other side of the cathedral, the Presbytere houses two permanent exhibits. The all-encompassing “Mardi Gras: It’s Carnival Time in Louisiana” tells the story of the Carnival traditions in Louisiana; the dazzling costumes alone are worth the visit. The “Living with Hurricanes: Katrina and Beyond” exhibit offers interactive displays and artifacts related to that disaster. To give your feet a break, grab a mule-drawn carriage tour on Decatur Street right outside the Jackson Square gate. 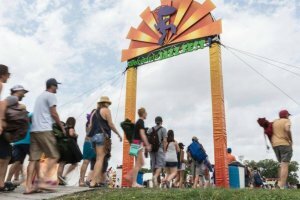 It’s first-come first-served, 8 a.m. through midnight daily ($40). The Dixie Bohemia tour is a good alternative to a daytime walking tour and covers the French Quarter and, depending on the time of day, either St. Louis Cemetery #1 or the Marigny. It’s perfect for families with small kids because it’s one hour long and can seat up to eight passengers. If you want a quick respite from the crowds, Louis Armstrong Park just across Rampart Street in Treme is a 32-acre expanse of green and is excellent for a quiet walk and turtle-spotting. Or head to the Mississippi River boardwalk and watch the boats go by. New Orleans is still a busy port, and you can spot freighters, cruise ships, barges, tugboats, and the uniquely Twainesque Steamboat Natchez. Bring a po-boy or a muffuletta for a bench picnic, and walk the stretch of the riverfront dotted with public art and street performers. If you have a few hours to spare, the Audubon Aquarium of the Americas, located on the riverfront, will keep your kids enthralled with its walk-through tunnel, otters, penguins, sea turtles, a stingray touch-pool, and an expansive replica of an offshore oil rig submerged in 400,000 gallons of water. On the other side of the French Quarter, the Audubon Butterfly Garden and Insectarium, located in the U.S. Custom House on Canal Street, is packed with bug-centric interactive exhibits and features a dreamy butterfly garden. Your kids will probably get a kick out of the Maskarade, 630 St. Ann Street, which features a selection of fabulous creations by local artists as well as high-end handmade Italian masks done in the Venetian style. Or visit Mask Factory, 515 Decatur Street, to get a souvenir to take home. Also on Decatur, Shops at Jax Brewery is a four-story mall full of gift shops, boutiques, kiosks, and restaurants. Further down is the French Market, perfect for browsing, with its six-block-long stretch of the farmer’s market, flea market and food stalls. 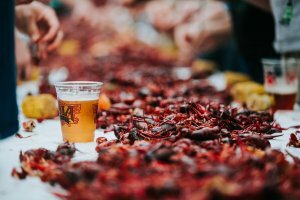 Vendors come from all over the world, and whether you are looking for a bottle of Louisiana hot sauce to bring home or spices or a Zydeco CD — you’ll find it there — along with raw oysters, po-boys, gourmet cheese, and pralines. Happy browsing and exploring, family-style!